My husband and I don't believe in taking our kids trick or treating for their own safety. So we usually try to make it to one or two Halloween events going on around our area. 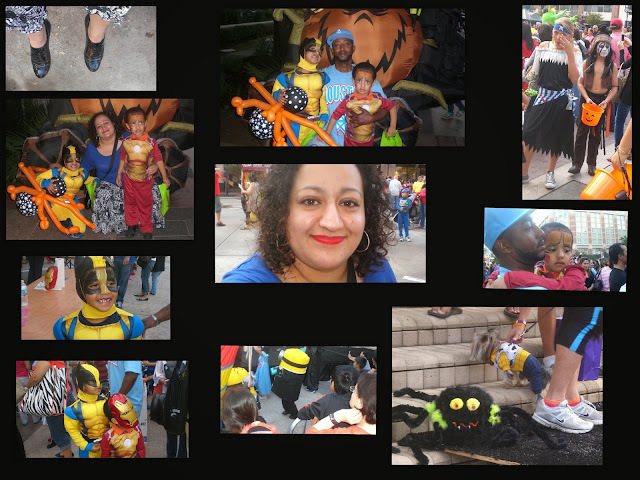 This year we took the boys to Sugar Land Town Center for their Halloween festivities. I have been sick for the last 3 WEEKS with the most wicked cold and really wasn't feeling up for getting dressed so I threw on a broom skirt, long sleeve top, ALDO oxfords and tried to look a little presentable with my MAC Ruby Woo lipstick. This was the weekend before Halloween. The night of Halloween was spent feasting on popcorn balls and caramel apples!